The fertilizer industry is plagued with a tremendous problem concerning waste disposal and dust because of the very nature of production that involves large volumes of dusty material. Jones and Olmsted  described the waste disposal problems and pollution control efforts at such a plant, Northwest Cooperative Mills, in St. Saul, Minnesota. Two types of problems are associated with waste from the manufacture of ammonium phosphate: wastes from combining ammonia and phosphoric acid and the subsequent drying and cooling of the products, and wastes from the handling of the finished product arising primarily from the bagging of the product prior to shipping. 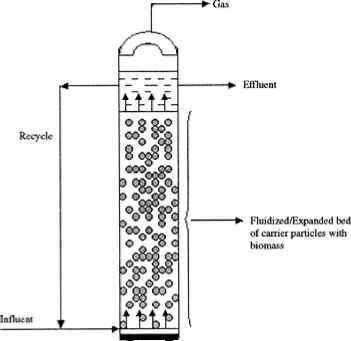 Because the ammonia process has to be "forced" by introducing excess amounts of ammonia than the phosphoric acid is capable of absorbing, there is high ammonia content in the exhaust air stream from the ammoniator. Because it is neither economically sound nor environmentally acceptable to exhaust this to the atmosphere, an acid scrubber is employed to recover the ammonia without condensing with it the steam that nearly saturates the exhausted air stream. Drying and cooling the products of ammonium phosphate production are conventionally achieved in a rotary drum, and a means must be provided to remove the dust particles from the air streams to be exhausted to the atmosphere. At the Minnesota plant, a high-efficiency dry cyclone recovery system followed by a wet scrubber was designed. In this way, material recovered from the dry collector (and recycled to the process) pays for the dry system and minimizes the load and disposal problem in the wet scrubber, because it eliminates the need for a system to recover the wet waste material that is discharged to the gypsum disposal pond for settling. The remaining problem of removing dust from discharges to the ambient air originating from the bagging and shipping operations is the one most neglected in the fertilizer industry, causing complaints from neighbors. Jones and Olmsted  reported the installation of an elaborate, relatively expensive, system of suction pickups at each transfer point of the products in the entire bagging system and shipping platform areas. The collected dust streams are passed over a positive cloth media collector before discharge to the atmosphere, and the system recovers sufficient products to cover only operating expenses. The filtered gypsum cake from phosphoric acid production, slurried with water to about 30%, is pumped to the settling lagoons, from where the clarified water is recycled to process. To provide a startup area, approximately two acres (or 8100 m2) of the disposal area were black-topped to seal the soil surface against seepage, and the gypsum collected in this area was worked outward to provide a seal for enlarging the settling area. A dike-separated section of the disposal area was designated as a collection basin for all drainage waters at the plant site. From this basin, after the settling of suspended solid impurities, these waters are discharged to surface waters under supervision from a continuous monitoring and alarm system that guards against accidental contamination from any other source. Air streams from the digestion system, vacuum cooler, concentrator, and other areas where fluorine is evolved are connected to a highly efficient absorption system, providing extremely high volumes of water relative to the stream. The effluent from this absorption system forms part of the recycled water and is eventually discharged as part of the product used for fertilizer manufacture. The Minnesota plant requires a constant recirculating water load in excess of 3000 gpm (11.4 m3/min), but multiple use and recycle reduce makeup requirements to less than 400 gpm (1.5 m3/min) or a mere 13% of total water use.